Arguably one of the most versatile fruits out there, lemons aren't just a great addition to both alcoholic and non-alcoholic beverages, they can also be used in a wide range of sweet and savory dishes. If you want the opportunity to enjoy delicious fruit, freshly picked from your own tree, our Meyer Lemon Trees for sale could work really well. Available from established growers, each lemon tree has been carefully planted and established, ensuring you receive a high-quality item that's been given a good start. Lemon trees can't withstand the cold – if you live in a cooler climate, it's best to grow them in a container. 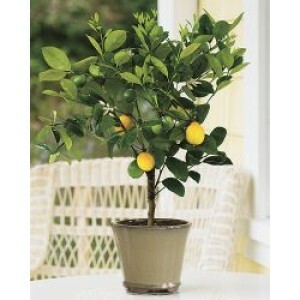 Make sure the container has plenty of drainage holes, as lemon trees don't thrive with soggy roots! They need watering on a “little and often” basis. A reasonable degree of humidity and regular feeding for constant nutrition are both recommended in order to let your lemon tree thrive. Please contact us at 866-216-TREE (8733) if you have any questions, concerns or prefer to order over the phone. Email us anytime at support@lemoncitrustree.com.